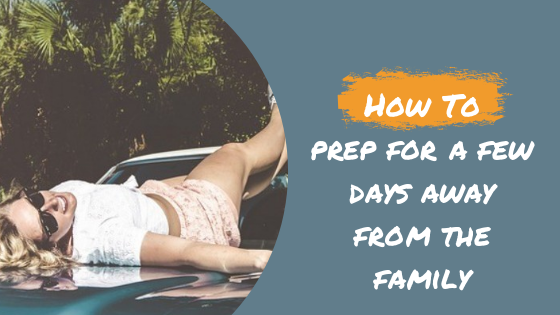 How I prepare for a few days away from the family…..
A weekend (or more!) away from the kids is pretty infrequent. The last time the kids and dad had a mom-free weekend was probably last Summer. So my best guess is maybe it happens once a year? In order to not break the bank, I try to leave meals and some goodies ready for the taking. But I also budget for at least one meal out. A few years back when the cat was away for the first time in many (many!) years, the cat called home to discover the mice eating lunch at about 3 p.m.
And that lunch was cereal. While that did not thrill the cat, that is still one of our families’ greatest memories. And so I have come to embrace that having a vacation from mom is also a good thing for everyone. Still, there are schedules and budgets and life that continue on without me. Humbling, no? And so Mom leaving requires some preparation. As a mom I’m sure you all are similar and that you don’t actually pack for yourself until everyone else is taken care of. So here’s what I do in terms of preparation for a few days away. + Find scrap paper. Use one blank sheet per day I am gone. No, the usual family calendar won’t work for us because it’s in Mom speak and does not include all those little details I assume or already know. + Write the day and date largely on top of each corresponding page. * Write the days’ schedules, including meal options for that day. I usually include one or two freezer meals that I place in the fridge freezer, as well as a fun pasta dish or similarly easy dish. + Come to terms with the fact that these are, indeed, options. They may opt for something I don’t love. +Back to the schedule. Be super clear about each event. Day and date on top of each page. Include best time for departure, as well as actual event time. If kids are riding with or participating in the event with another family, include a contact name and number right next to the event on the schedule. +Include suggested packing list. Extra clothes, snacks, choir music, school projects, art supplies, books, Etc. + On days with open times, suggest activities that you know about that others might not. Like Food Trucks at Park, Craft show at the school or potluck at church. You know, those optional “if we happen to be free” events? + If something is particularly early or later than usual, suggest nap or rest times or early bedtime. + Leave emergency cash just in case. Fully accept that the emergency might be ice cream. + Include dinner plan for the evening of your return. This is often a freezer meal at my house so that mom does not have to cook and can ease back into being a productive mama. + Finally, release all expectations and focus on my own goals. So there you go, a little peak into my brain. I hope you have had a restful weekend and have a productive week! This post was reproduced from an email originally sent to my mailing list. It was received very positively so I decided to share it far and wide!